You say you love Mezlan shoes but sometimes don't have Mezlan money, so Giorgio Brutini can take up the slack because they make quality mens fashion dress shoes that are all leather with leather soles and are Italian style to boot. 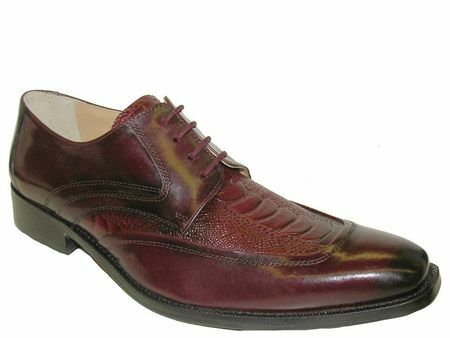 This Burgundy dress shoe features a U-Wing style upper designed in Italy with Ostrich leg print leather and calfskin to balance it out with a full leather sole. Get your style, value and quality with Giorgio Brutini Shoes.